A beautiful spacious gingerbread cottage with a wraparound porch to relax in rocking chairs after a long day at the beach. 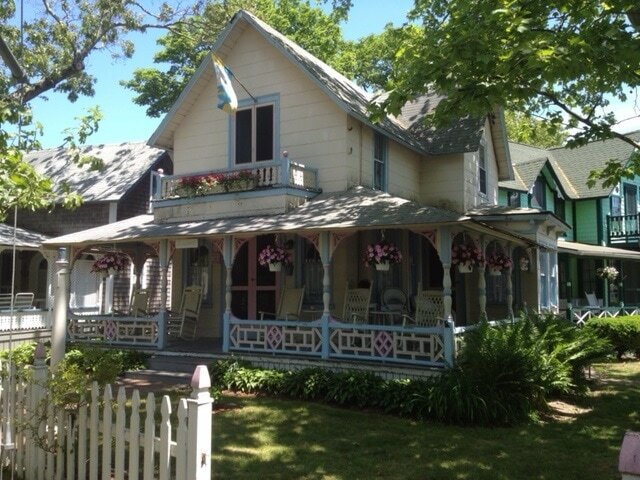 This cottage is located in the historical Martha’s Vineyard Campground facing the Tabernacle in Oak Bluffs on the island of Martha’s Vineyard with easy access to the Main Street (within a block), shops, harbor, ferry and beaches all within walking distance.The cottage on the first floor opens up to a living room (cable T.V. and WiFi), dining room with a sitting area, eat in kitchen, and bathroom. The second floor has three bedrooms. The front bedroom has a queen size bed and a single bed with a private balcony. The back bedroom has a queen size bed and the side bed room has a single bed. One parking space with rental. Sleeps: 6 comfortably with additional sleeping for 2 on a pull-out couch in the living room. Additional photos available in May.